1. Volume Bearish Divergence. Before we have a change in trend we need to see Exhaustion buying volume. Then the buying pressure needs to back off at new Highs and this will cause a First Bearish Divergence signal. 2. Price Signals End of Trend. 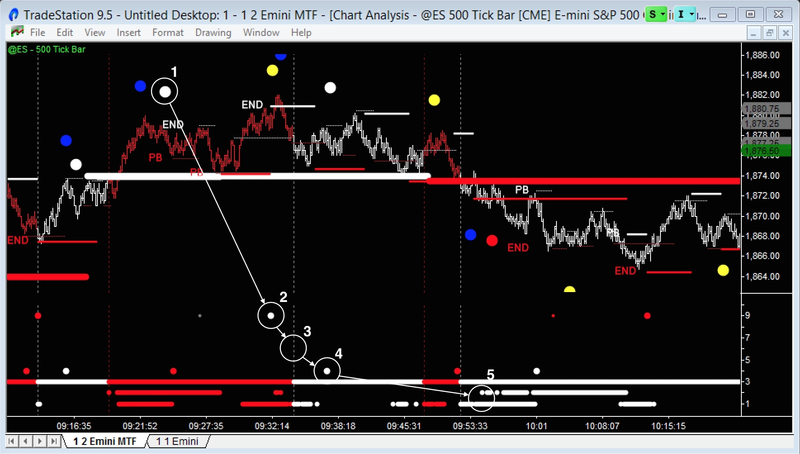 Next look for End of Trend signals. If the trend is strong we’ll need to see them on the intermediate and highest timeframes. But if the trend is weak we’ll only need one on the lowest timeframe and syncing up with a cyclical turn on the highest timeframe. 3. Price Breaks Support. This is the first sign of weakness but not where you want to enter. We always test back up after an initial break of Support – and you don’t want to get stopped out on this retrace. 4. Low Risk Entry Point. The first cyclical turn after a break of Support will generate a LREP (Low Risk Entry Point) signal. If you’re an aggressive trader you could enter Short here. But I prefer to wait and see and get a little more confirmation. What I’m looking for is Professional up bars that then have their Lows broken – a sign that Professionals are Shorting any strength. 5. Downtrend Confirmation. As soon as we start breaking Support levels on both the low and intermediate timeframes, we have confirmation of a strong downtrend. And the downtrend will not be over until we see End of Trend signals, most likely on both timeframes. So time to adjust your target and push it out to maximise profit.